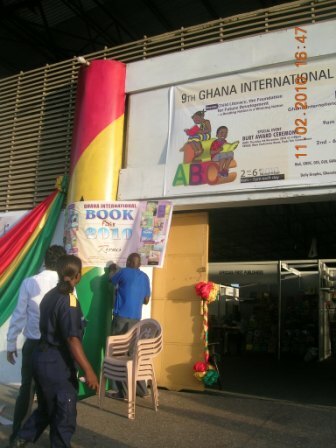 I did go to the 13th GIBF (Ghana International Book Fair) but I admit it was on the last day – Saturday 7 November. So if I sound a bit disappointed, maybe that is the reason. Several of the stands had no one there so I guess the companies/organizations felt it wasn’t worth their while to be there on a Saturday. I did notice several representatives of mostly Indian printing companies which was quite interesting. The other issue which slightly bothered me was the fact that there was going to be a launch of a book about Ghana’s President in the late 1970s/early 1980s, Dr Hilla Limann, which I hadn’t heard about! So I had to make do with online reviews. And eventually I will see, and probably buy, a copy of the actual book. I admit I had originally thought I would be able to attend earlier in the week, but that didn’t work out. This is not to say that I didn’t buy anything; I did. A couple of children’s books as gifts and a couple of adult books for work – all from Sub-Saharan Publishers who I am always happy to support, plus I usually find they have something which interests me. I am looking forward to seeing and buying a copy of the latest Caine Prize collection of short stories which Sub-Saharan are co-publishing with New Internationalist, and other publishers on the African continent. I did visit the Ghana International Book Fair 2010 at the Ghana Trade Fair site in Accra twice, but didn’t attend any of the related functions, so of course what I have to say is purely limited to the actual exhibition space, rather than any of the associated activities. This year the venue of the GIBF shifted back to the Ghana Trade Fair from the National Theatre where it has been held for the last several [I’m afraid I don’t remember how many] years. I guess each venue has its advantages and disadvantages – and being on several floors at the National Theatre could definitely be considered a disadvantage, with some members of the public being unwilling to move upstairs. Similarly some may have found it a bit of an effort to move out of the main exhibition space to where one exhibitor – EPP – usually had its space. I guess also if there were a lot of visitors, then it could seem to be a bit crowded. So, obviously one of the main advantages of the Trade Fair is that it is big, with plenty of space – but it seems to me to be almost be tooo much space. Although stands were allocated, according to the Fair brochure, to companies, there were lots of empty spaces, and even on the last day, the venue could hardly be called crowded! My other “beef” is with the attitude of some of the people working on the stands, and this is not just at the Book Fair, but other events at the Trade Fair. I know that it is warm, and perhaps nothing much is going on, but to me “sleeping” while on duty is not really acceptable, and in my view reflects on the company an individual is supposed to be representing. Of course exhibitors could make sure that those manning the stands run shifts, rather than “working” a 12-hour day? I didn’t buy many books, but then that is not too surprising, as the orientation of the Fair was very much towards child literacy. Nevertheless, I look forward to the next one!